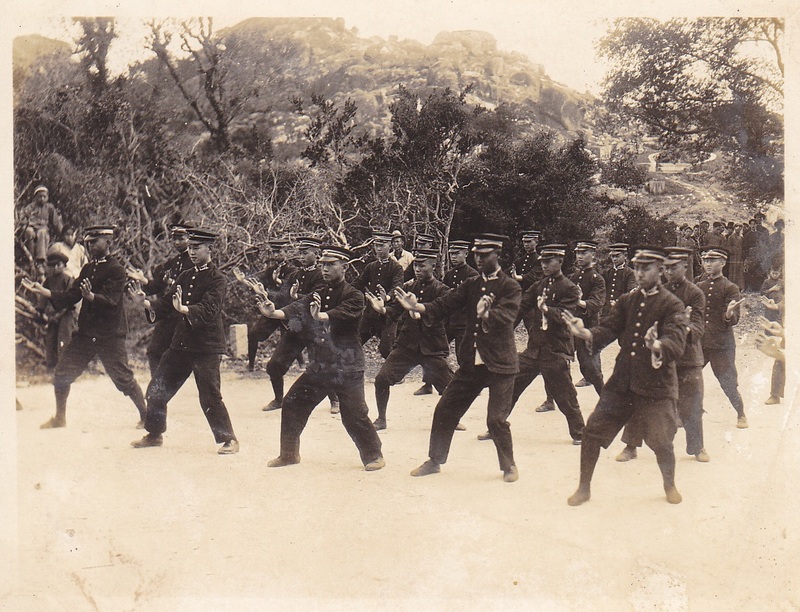 Through a Lens Darkly (4): Chinese Martial Arts and the Military. I would like to use two sets of images to explore the somewhat complex subject of the Chinese military’s relationship with the traditional martial arts. Modern Chinese history has witnessed a vast number of military and para-military forces and not all of them shared the same attitude towards the martial arts. This is only one of the hurdles that a researcher in this area needs to overcome. At the most basic level the distinction between the “military sciences” and the “martial arts” is a rather recent one in China. Swords, spears, bows and poles were the traditional weapons of Chinese military and law enforcement organizations right up until the turn of the last century. Clashes with the British in Guangdong Province in the mid 19th century forced the Chinese government to begin to modernize their army, and the Taiping Rebellion did even more to promote the widespread adoption of modern firearms and artillery. Nevertheless, it probably wasn’t until about 1900 (the era of the Boxer Uprising) that large parts of the Chinese military were armed with modern weapons including bolt action rifles, heavy machine guns and breach loading artillery. Even at this late date second line troops were often left with black powder rifles, spears, swords and bronze or iron muzzle loading canons. During the last few decades of the 19th century all members of the Chinese military trained in the traditional arts, basically following the suggestion of General Qi Jiguang at the end of the Ming dynasty. Martial arts training for civilians was valuable precisely because it could lead to a career in the military. All of this changed pretty fast, and it appears that most traditional training was discarded by the 1910s. As modern rifles became more available in large numbers the Chinese found it no more practical to train their troops in swordsmanship than the Europeans did. Further, once the Imperial military exams were abolished in the early 20th century those wishing to join the officer corps no longer had any reason to study archery. This transition posed an existential crisis for the Chinese martial arts community. The military had been the single largest employer of martial artists. Further, many of the individuals that did teach civilians had a background as military instructors. This was where most martial artists learned their trade. Even worse, the nation’s public transportation pathways were modernizing at the same time as the military. The increasing numbers of trains and steamships meant that it was no longer necessary to hire armed escorts to accompany goods on the dangerous cross-country journey. So within a decade or two the Chinese martial arts lost their first and second most important employers. Add to this the humiliation of the Boxer Uprising, when the government banned hand combat schools and intellectuals were actively calling for the abolition of these “backwards” and “superstitious” arts, and the future looked grim. Luckily for the Chinese martial artists, modernization is a complicated and ugly process. Japan’s successful industrialization and growth as a regional power raised questions about the effectiveness of “Budo.” If the traditional Japanese arts helped to strengthen the Japanese people, why couldn’t the Chinese arts do something similar at home? As a matter of fact, a number of reformers in the Chinese martial arts studied in Japan during this period. Even more important was the betrayal of the western powers following WWI. Rather than returning Germany’s colonies to Chinese control (as had been explicitly promised in an effort to gain Chinese support) these areas were instead awarded to Japan. To say that the Chinese were disenchanted with the western liberal democratic powers would be an understatement. The adoption of a western form of government no longer seemed like such a good idea. This is when young Chinese intellectuals started to investigate Marxism and the Soviet Union made its first inroads into its eastern neighbor. Andrew Morris (Marrow of the Nation, 2004) has demonstrated in great detail how these same trends affected the world of physical culture. Suddenly German drill exercises and French gymnastics lost their luster. This growing disenchantment with the west was just the opening that domestic reformers needed to start promoting their own “scientific and modernized” martial arts. By in large this is what we still teach today and think of as “traditional” hand combat training. The Jingwu Association was the first of these reform movements to succeed on a national scale. Among their many projects they wanted to show how the Chinese martial arts could be used to strengthen soldiers (especially in the areas of hand to hand combat and bayonet fighting) and future soldiers (middle and high school students). The nationalist government took note of these promises. Once they gained control of the country they set about creating their own infrastructure and ideological movement, embodied in the Central Guoshu (national arts) Institute, that would be responsible for overseeing the martial arts, promoting modernized and rationalized training. This had a lasting effect on the Chinese military. Once again the traditional martial arts were included in the training curriculum, both as an effective tool for hand to hand combat, but also as a way to increase the physical stamina and psychological courage of the troops. In essence we were right back to where we started with Qi Jiguang, except with a new national bureaucracy and a lot more khaki. Nothing represents this transition better than the reintroduction of the sword as a standard infantry weapon, this time in the form of the dadao, or big knife. Obviously swords of any length or style are of limited utility on the modern battlefield. What is really remarkable is how much use the Japanese and the Chinese actually managed to get out of theirs in the 1930s and 1940s. The picture displayed above is a recent addition to my collection of historical ephemera related to the Chinese martial arts. This is a direct scan of an original 4 inch by 3 inch photograph. As you can see there is some damage to the piece, and the photographer overexposed the foreground. Nevertheless, it is a rare and historically interesting image. 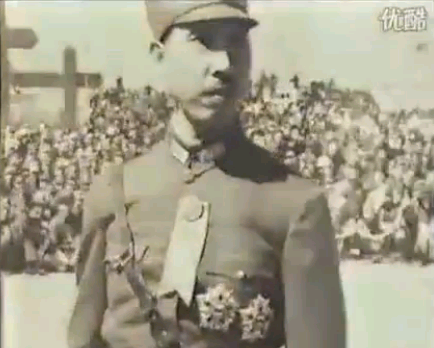 Judging from the uniforms (see especially the caps and badges) the troops are members of the late Qing imperial military. That would put the date of this photograph sometime before 1911. I suspect that this photo might date from the end of the 19th century, but a very early 20th century date cannot be ruled out. The photo shows a unit of about 15-20 individuals performing some boxing routine in unison. This might be part of a special demonstration or celebration as a number of civilians have gathered to watch the demonstration. Obviously this picture raises a number of questions, starting with the exact date, the identity of the unit and the form that they are demonstrating. I hesitate to speculate on what style they have been trained in as so many use that movement or something similar to it. This image is valuable precisely because it is a late record of martial arts training in the Chinese military before these practices were abandoned and then later brought back. All of which bring us to our next item, and the early 20th century renaissance of interest in the martial arts promoted by the Central Guoshu Institute. In 1937 the Japanese invasion forced the Nationalist government to abandon the capital and retreat to the interior regions of the country including Hunan Province. The Guoshu movement was part of this retreat and it attempted to reconstitute itself in Hunan and carry on its mission despite dwindling resources and personnel. Recently an undated propaganda film was rediscovered that shows a Guoshu demonstration which took place in Hunan at about this time. Its a significant film for a number of reasons and you may want to take a couple of minutes to watch it. Below are a couple of stills from the video that I thought were particularly interesting. It starts off, much as one would expect, with the obligatory shots of massed troops doing their military forms as one. 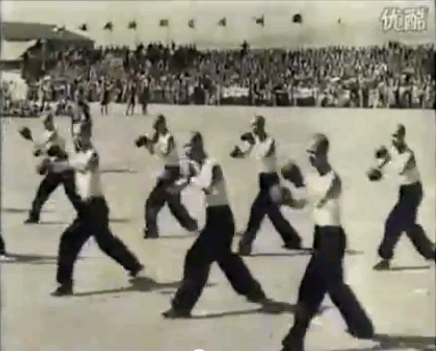 Guoshu demonstration by Nationalist Troops, Hunan 1937. After that the film introduces some female martial artists. First a large group of high school aged girls are shown performing a set. Next two more mature women are shown demonstrating a two-man fighting form. Their demonstration might actually be the most interesting part of the film on a technical level. On a social level it is also interesting to see them as the Guoshu movement was not as friendly to women as the Jingwu Association had been and reversed some of the social reforms that had been taking place in the martial arts. At about 1:40 I saw something that Wing Chun students might find interesting. A western style boxing team was introduced. These individuals started off demonstrating something that looks a lot like a classic Wing Chun chain punch (complete with foot work) before they paired off for their individual matches. Needless to say what followed looked much less like Wing Chun, but it does make one stop and think. 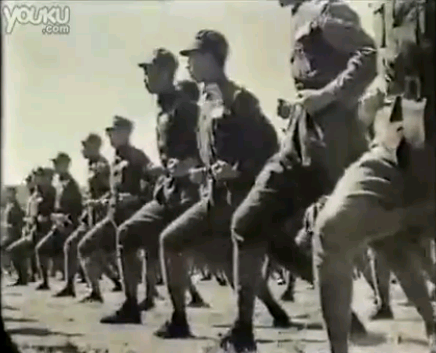 Chinese military unit demonstrating the “chain punch.” 1937 Hunan, Guoshu Demonstration. The end of movie then features demonstrations by a number of VIPs. The most interesting of these is probably General Zhang Zhijian who shows us his Taiji at 2:20. General Zhang is an absolutely critical figure in the history of the Chinese martial arts under the Nationalist party. He personally founded the central Guoshu movement and oversaw many aspects of its evolution. We don’t have a lot of photos of Zhang, let alone videos of him demonstrating his style, so this is a very interesting record for historians of the Chinese martial arts. As a matter of fact, I have decided to add Zhang to the list of figures to be profiled in our “Lives of the Chinese Martial Artists” series, so watch for that sometime in the next few months. General Zhang Zhijiang, overseeing a Guoshu demonstration in Hunan Province. These images are a wonderful remainder of the complicated and evolving relationship between the Chinese military and the traditional martial arts. Please contact me or leave a comment if you have any additional information about the individuals in either the top photo or the bottom video. Ops sent the previous one without finishing. The picture you have as Zhang Zhijiang is actually Chairman He, Zhang is the next person who demostrates Taijiquan. Also I made a mistake is not boji, but puji (撲擊) and not wing chun (at least that is not what the narrator is saying). Can you please provide the original source for the first picture at the begining of the post in order to dig out more info? Thanks. 2. 湖南軍訓學生團體操, Húnán jūnxùn xuésheng tuántǐ cāo. Wow, thanks so much for your time and effort. I am sure that all of the readers (and me) will find this very helpful. And thank you for clearing up my improper identification of He. I totally agree that when is happening at 1:40 is not Wing Chun. My only point was that I thought students of Wing Chun would find it interesting. The photo at the top of the post is a mystery. I am afraid it doesn’t have an original source, or if it has been published anywhere I am not aware of it. I actually bought it as an old, somewhat damaged, photograph on ebay. I sometimes collect old martial arts ephemera. I am especially interested in postcards. This turned out to be a photograph rather than a postcard, and there was no information on the back of the picture indicating anything about the subject. Under magnification you can make out some of the insignia on the uniforms, but that is as far as I have been able to get with it. Sorry I can’t be of more help on that. But if you figure out any more information in it please let me know. It seems very interesting. If you dont mind I will post your link in my Facebook page and will ask Dennis Rovere if he can help identify some clues on the picture. You are doing a fine job with your page. I will comment when I can if I have info to share, keep it up! PS: My wife is Chinese so she is the one who helps me with the translations, credits go to Mei Cheung ;). Cheers. Yeah, feel free to post the link and ask around about the picture. It was a neat, if somewhat mysterious, find. Please extend my thanks your wife for her fine work.